This is The Inner Adventure’s first fictional publication, a short story by one of my writing class participants. It is an adventurous journey into love’s great flow. The day he told me he loved me was also the day I learned he was married. We quietly communicated across a small café table in Covent Garden, London, where we both live. The sweet scent of cinnamon wafted lightly from the open kitchen. The table’s soft candlelight emitted a gentle glow. I had already fallen in love with him. A nagging voice had been telling me I should know more about him, but my longing for intimacy blurred my vision. Now I have left on a trip where I hope to find clarity. The sandy pathway from the hotel down to the river is narrow and windy. 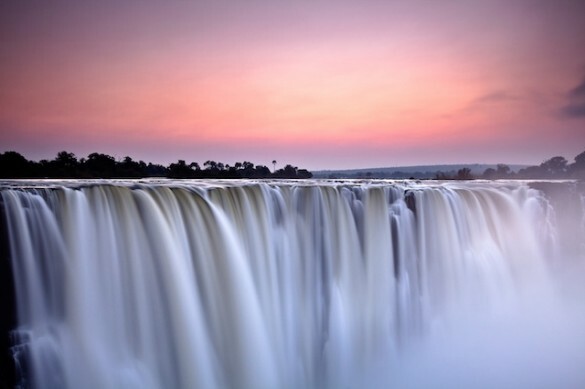 I hear the roar of Victoria Falls before I see them. The earth vibrates under my feet. As I stand at the top of the falls, the roar becomes almost deafening, the drop to the river below immense. A great chasm must have opened here a long time ago. An earthquake? I don’t know. But here I stand, inspired by the river’s mighty power, the spray cool upon my face. Refreshing. My body becomes smaller. My soul feels a connection, an expansion. I contemplate power. What is power without love? Or, what is true love without power? My emotions query this. Surely there is no power in love. My mind tries to intellectually understand. Yet I sense that to experience a higher love, true power is necessary. It would be wonderful if Sakhir could be here with me to share this moment. That morning that he told me, I had awoken from sleep with lyrics from the song “Smoke Gets In Your Eyes,” but I ignored the guidance. I didn’t want to listen. There in the café, he reached out his hand to touch mine, noticing the sadness in my eyes. A feeling of loss enveloped me. Would I lose him? “I’m so sorry. I didn’t mean to hurt you.” Sakhir appeared to be genuinely sorry. Now, at the falls, I remember his loving embraces. The way he would wrap his arm around my waist, gently pulling me close, his deep brown eyes lovingly searching mine. Tears well up in my eyes, emotions slipping between sadness and anger. I have always struggled with my emotions and power. It is true that power can be used to control and smash its victim, but I am beginning to realize that power can also set me free. It can propel me forward, help me fulfill a dream and reach a goal, provided love embraces it. True, it took courage and trust to travel here alone and be here in this moment, but I have never realized that I also need power. There have been times when I’ve had an awareness about a project or a dream that I could embark upon but it was immediately crushed by “I can’t,” rather than “I can.” Yet now I wonder. Is “I can’t” actually true? There is a power within me. I may be physically alone in this moment but that inner loving Presence that tried to alert me about Sakhir will always love me. It’s wonderful to physically connect with someone but eternal love is within me, even beyond this world. A feeling of freedom and peace comes over me. I return to this moment. Raw power is within my vision. Such raw power only a higher love can channel. There is almost always a rainbow across the Victoria Falls, appearing fragile as if it would suddenly disappear, but it does not. I venture closer, carefully, steadying myself against a wide tree trunk just a few feet from the edge. Grateful for the ancient tree’s solid strength, I peer down, down, to the churning water below. I walk some fifty yards away from the falls to the river. There are no signs warning of danger from river or predators, and the heat is so intense that I cautiously sit on the edge, letting my feet and calves dangle in the refreshingly cool water. While keeping a watchful eye for possible danger, I am aware that the current feels soft here but I notice a strong, sometimes swirling current nearby. The water flows to the roaring falls a short distance away. I have never seen such a river as this, so wide I cannot see the other side. Appreciating the solitude, I contemplate the flow of the river, feeling its strength and power. Lifting my legs out of the water, I turn around to reach for a towel. Suddenly my attention is drawn to a tall, slim, dark-skinned man standing some distance away, watching. He is lightly clothed with one hand resting on a wooden stick. Fear grips me as I remember stories of assault and robbery taking place here. Calling on the Beloved for protection, I casually but quickly dry my feet, slipping them into my sandals and stand up. My heart beats fast but I know I must appear calm. I quickly walk back to the hotel, venturing a sideways glance in the man’s direction. A sense of relief overcomes me as I see him walking away into the jungle. I remember the song “The Power of Love.” Love has a greatness that Power shares. It catapults soul upwards. Chains, which so long have tethered It, drop away and soul expands, grasping freedom and soaring like an eagle. The heavy chains of the world evaporate as they give way to the Power of Soul, like the Phoenix rising from the ashes. This beginning awareness that I am something greater than my body, thoughts and emotions feels wonderful and liberating to me in this moment. How beautiful that our Creator wishes for us to know this. Now my eyes flood with tears and I sob uncontrollably, asking my inner guidance, my Beloved, for help. I remember the image on the card. A sunset always holds the promise of a new day, a new beginning. In the next few days I sway between a sense of loss and an emerging feeling of freedom and empowerment. It is true: Love and power do embrace each other. Holding my Beloved’s hand I find the courage and power to step forward into the dawn of a new day. Theresa Dunford lives in rural Perthshire, Scotland, with her husband, Barry. She is a student of MasterPath, Divine Science of Light and Sound. P.S. If you enjoyed this, I invite you to subscribe to The Inner Adventure so you can receive weekly inspiration in your email box. A wonderful word painting, Theresa, full of melody, tension, harmony and resolution. No words can adequately describe what you passed through in emotions and surrender. Leaving all aspects and attachments to this world is the crucifixion we all must undergo in order to reach our Beloved and merge with our true spouse internally. If we could leave intentionally and with will power, I would have done so thirty years ago. Alas, attachments and identifications with this world run extraordinarily deep, more than I would ever have imagined. Your writing is deep and evocative…keep it up! You have a fabulous teacher in Lesley! Thank you for your beautiful words, expressed with such deep clarity. Lovely and touching story. How masterful each stroke of the Divine through each of us in our journey back home. Thank you Theresa! A wonderful insight into the surrender of the emotions and mind. Beautifully written; a compelling tale with an enlightening resolution. Thank you for sharing Lesley. Thank you all for commenting. It is such a treat for me to publish a work of fiction that has so many of The Inner Adventure elements: adventure, the inner journey of soul, and an experience lived with the loving touch of the Beloved. We are so blessed. Thank you Lesley for your loving support and inspiring writing course.